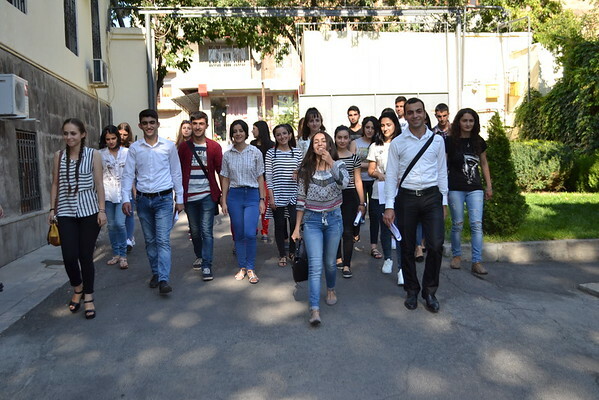 It’s time to congratulate 170 young Armenians who were selected by FAR’s Educational Program’s Coordinating Council to receive scholarships to attend universities, colleges and vocational schools. More than 200 students applied to FAR’s nine different scholarship programs. The selected 170 were chosen based on their academic results, and the information gathered during more than 100 home visits from FAR staff. Scholarships will cover 50 percent of students’ tuition fees as long as they continually demonstrate excellent academic progress throughout their studies. Arthur Harutyunyan, the youngest of six, is from the border village of Baghanis in Tavush Province. With a great desire to develop tourism in his native region he’s heading to Yerevan State University’s Ijevan Branch’s Faculty of Economy, Service Section with the help of the Mathevosian Scholarship. He is one of the 31 who were awarded the Mathevosian Scholarship this year, and the only one from his own graduating class who is attending college. “Today, frequent cross-border shootings are a common thing for us rural children. We know what to do and how to act when there is firing from the Azerbaijani side. But what I dream about is prosperity, with many tourists, economic stability, and happy kids. Thanks to FAR, I hope to realize my dream,” said Arthur. Just as with Arthur, the vast majority of the students awarded scholarships live in very poor conditions. Yet all of them value good education and strive to become specialists. Tamara and Marina Avetisyan were young when their mother left them. They live in Yerevan. Their father was unable to raise them either because of his own debilitating health problems but their grandmother’s sister Valentina Arakelyan never left them. She took care of their education and upbringing, but could hardly manage their higher education costs on her monthly pension of $110. So, it‘s FAR’s turn to take the lead. Now, Tamara will study pharmacology with the support of the Mathevosian Scholarship, and Marina will become a hairdresser with help from the Gulamerian Scholarship. Marine Yeremyan from Ujan, Aragatsotn Province, is a future journalist. With excellent grades at school she’s been accepted to Yerevan State University’s Faculty of Journalism. Marine comes from a large family who survive on agriculture. She herself often goes to the fields to help her parents work. “Learning that I was accepted into FAR’s Baghsarian Scholarship was like a real miracle. I am sure it will change my life and I am very thankful to the benefactors and to FAR,” she said. “I am very happy for the students who we were able to help through this opportunity to receive a higher education. It was very difficult to narrow the selection pool with so many vulnerable yet brilliant minded applicants. I wish them great success,” said Edik Karapetyan, FAR’s Education and Science Programs Manager. Congratulations to all of our new scholarship students! We wish you great success!